The U Value indicates how good materials are at retaining heat, usually applied to walls, windows or doors. The lower the U Value the better the thermal performance will be. So if you have some insulation in your walls you will want to achieve a U Value as close to zero as possible. Knowing the U Value of installations and insulation that you have or are looking to have in your home is important if you want to understand how thermally efficient your home is or could be. 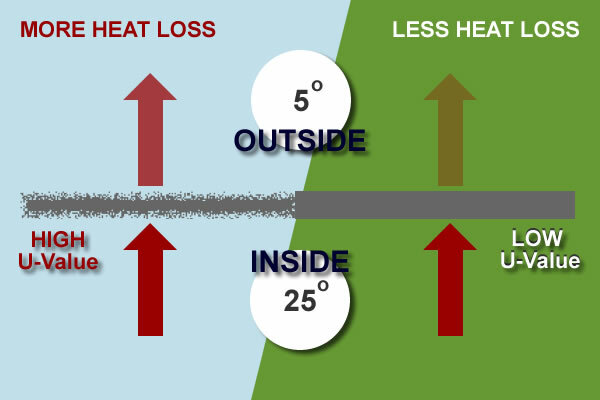 Thermal transmittance or coefficient of heat transmission also known as the U Value is a measure of heat loss through materials or structural elements where there is at least a 1 degree difference in temperature between the inside and outside faces. U-Value (w/mÃƒâ€šÃ‚Â²K) = the measure of heat loss per unit of surface area. Lambda value ÃƒÅ½Ã‚Â»(w/mK) = the value of the insulating capacity of the product or material. U-Values are calculated as the reciprocal of the sum of R values. WoahÃƒÂ¢Ã¢â€šÂ¬Ã‚Â¦ Ok, so where we see the U Value we know that there was a neat calculation made to determine it. Here is a handy list of typical U Values to use as a guide when considering home improvements and want to gauge thermal efficiency benefits. – Solid brick wall ÃƒÂ¢Ã¢â€šÂ¬Ã¢â‚¬Å“ U Value 2 W/mÃƒâ€šÃ‚Â²K.